Time to Schedule Spring Surveys! The spring season is rapidly approaching and it’s time for land owners, project managers, and others with biological compliance and permitting needs to plan spring surveys. EMC Planning Group biologists have the specialized knowledge and skills to complete a wide range of presence/absence surveys, and conduct habitat assessments for sensitive plant and wildlife species. Services include, but are not limited to, focused surveys for nesting birds, rare plants, California red-legged frog, California tiger salamander, burrowing owl, Swainson’s hawk, western snowy plover, and many more special-status species occurring in the region. Our firm also provides construction monitoring, regulatory agency permitting, restoration planning, and CEQA/NEPA compliance. Due to the limited survey window for various species, we recommend early coordination to schedule your spring biological surveys and avoid the risk of project delays. Please call senior biologist/certified arborist Andrea Edwards at 831-649-1799 ext.209 to discuss your project needs. The federal Migratory Bird Treaty Act protects the nesting activities of over 800 native birds, including common species. 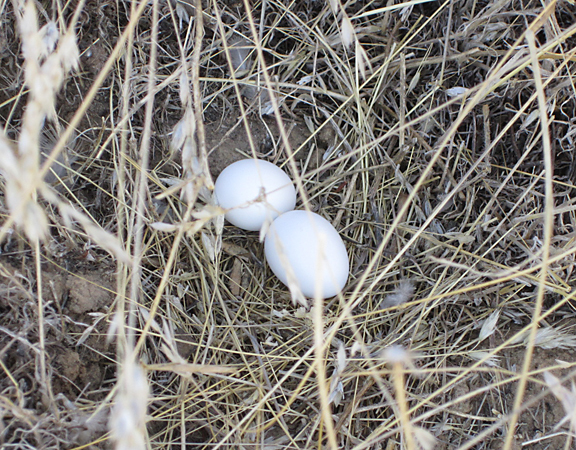 The California Fish and Game Code also protect birds and active nests/eggs at the state level, particularly birds of prey. Construction activities (including vegetation removal) have the potential to impact nesting birds if they are present on or adjacent to work sites. From February through August, or as specified in project permits/conditions, most construction work requires a qualified biologist to survey for nesting birds prior to the start of work. If active nests are present, the biologist will provide site-specific temporary avoidance measures/buffer zones, and monitor the nests until juvenile birds have fledged. It is important to prepare for these surveys early to keep projects on schedule and comply with federal and state laws. EMC Planning Group recently provided the SANDIS - Silicon Valley Division with environmental consulting services for the Malech Road Emergency Water Pipeline Repair Project located in the County of Santa Clara, just north of Morgan Hill. Our biologists assisted with initial design and staging efforts to minimize impacts to biological resources, including avoidance of federally listed Endangered Santa Clara Valley dudleya plants that occur quite close to the impact boundaries. We then conducted pre-construction biological surveys for nesting birds, American badger, and Bay checkerspot butterfly; survey results were negative for these species, so no project diversions or delays were necessary. During installation of the replacement pipeline, EMC Planning Group completed biological and cultural construction monitoring during all ground disturbance activities. In addition, this infrastructure repair project had to comply with the Santa Clara Valley Habitat Plan, which regulates and protects biological resources within its permit area in order to contribute to the recovery of special-status species. The Habitat Plan is intended to provide an effective framework to protect, enhance, and restore natural resources in specific areas of Santa Clara County, while improving and streamlining the environmental permitting process for impacts to 18 covered special-status species. We therefore assisted the County in obtaining a project permit per the Santa Clara Valley Habitat Plan requirements, which included a detailed assessment of impacts to smooth lessingia plants and serpentine bunchgrass grassland habitat. 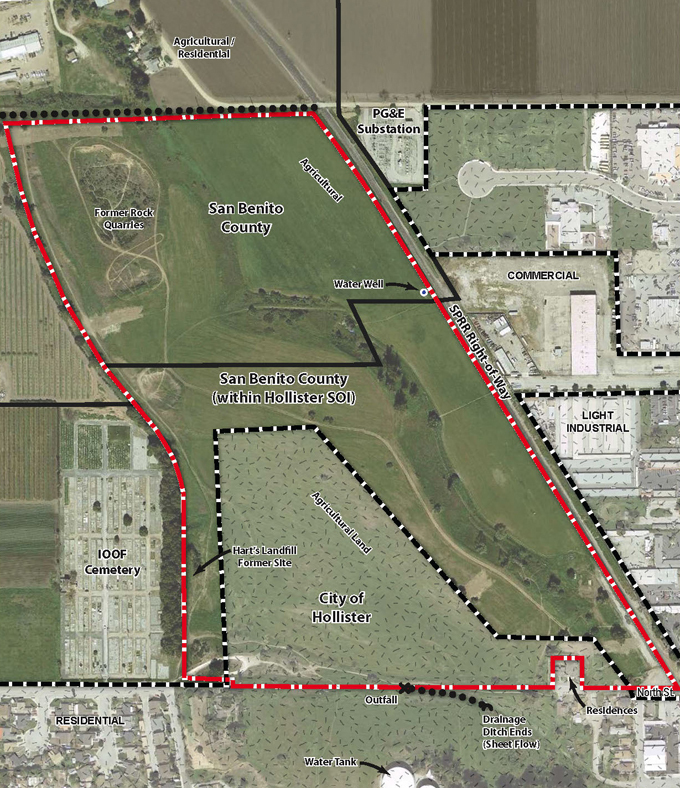 EMC Planning Group prepared an EIR for the subdivision of approximately 81 acres located partially within Hollister’s city limits. The project site is located north of the planned North Street Extension and west of the railroad right-of-way. The project includes a prezone, subdivision, and planned unit development, subject to approval by the San Benito County Local Agency Formation Commission for a sphere of influence amendment and annexation. The subdivision includes 283 single-family lots and one multi-family lot that could accommodate about 60 units, as well as an on-site water quality/retention basin, approximately 7.63 acres of open space, and several new roads servicing the development. Environmental issues addressed in the EIR included visual impacts, air quality, greenhouse gas emissions, cultural resources, geologic impacts (on-site fault traces), noise, traffic, public services, and utilities. EMC Planning Group prepared the draft and final EIR, a mitigation monitoring program, CEQA findings, and a statement of overriding considerations addressing significant and unavoidable impacts associated with traffic and agriculture resources. The Hollister City Council certified the EIR, adopted the statement of overriding considerations, and approved the project in December of 2016. Entitlement processing for permits, including application packaging. Site planning and lotting plans can be prepared in AutoCAD for electronic use by other professionals (e.g. engineers, architects, etc.). Our team has a proven track record of navigating the complex political and regulatory hurdles to obtain the necessary approvals. Clients include private property owners and developers, land use attorneys, real estate professionals, as well as cities, counties, and special districts. Please call our designer/senior planner Elizabeth King at 831-649-1799 ext. 204 to discuss how she can get your project underway. Copyright © 2016 EMC Planning Group Inc., All rights reserved. If you would like to be removed from our newsletter, please unsubscribe here.